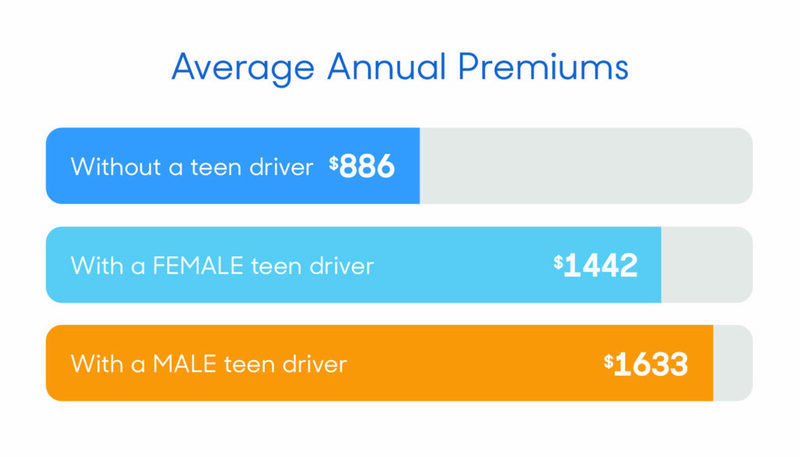 You may have heard (or experienced first hand) that insuring a teenage driver is expensive. Very expensive, according to a 2017 study by Quadrant Information and Insurance Quotes, which pegs the average rate increase after adding a teen driver at about 78 percent. Annual car insurance premiums often shoot up between 55 percent and 80 percent when you add a teen driver to your policy. The reason is costs so much to insure teens is that they’re a riskier bet for providers. Accident rates among drivers ages 16–19 are higher than for any other age group. To insurers, that means teens are more likely to end up filing a claim and requiring an insurance payment. Charging a bigger premium for young drivers is their way of making up for those potential future payouts. While you’re thinking about insurance for your family’s newest driver, keep in mind that your current insurer might not be your cheapest option. Every company calculates rates differently, giving various weights to things like age, location, gender, even GPA. Many offer special discounts for teens, though the savings opportunities vary by provider. Once your current policy expires, it’s worth shopping around to see if switching companies could help you save on your family’s car insurance. Teen drivers, statistically speaking, are far more likely to be involved in a collision than any other age group. That makes proper insurance for your kid(s) all the more important. If you currently carry lower liability limits (maybe even the minimum amount required in your state), we recommend reevaluating that policy when your teen gets their license. Here’s why: Car insurance with low liability limits tends to be cheap, which makes it an attractive option for anyone on a budget. However, state minimum insurance requirements are just that — minimums. They offer bare-bones coverage that often wouldn’t go far toward paying off repairs or medical bills after a serious collision. In a worst-case scenario, inadequate insurance could even put your family’s assets in danger (if the other person involved decides to sue for damages). Experts recommend liability limits of at least 100/300/100 (bodily injury/total injury/property) when you have a teenage driver on your car insurance policy. The point here is that accidents can happen, even with teens that have exemplary driving records to-date. Upping your liability limits ensures that your insurance is able to do what it’s supposed to — protect your family’s finances against the unforeseen. Check out this article to learn more about what “full coverage” looks like on car insurance and how to get it. Every state has different rules about when newly-licensed drivers need to be insured. In some states, teens must be covered as soon as they get their learner’s permit. In others, you can wait to add them until they’re fully licensed. On top of that, insurance companies often have their own guidelines for new drivers: Some will cover a teen with a learner’s permit for free, others bump your rate up right away, etc. The best thing to do is call up your current insurer, who can explain exactly when your teen needs to be insured and how much it’ll cost you. 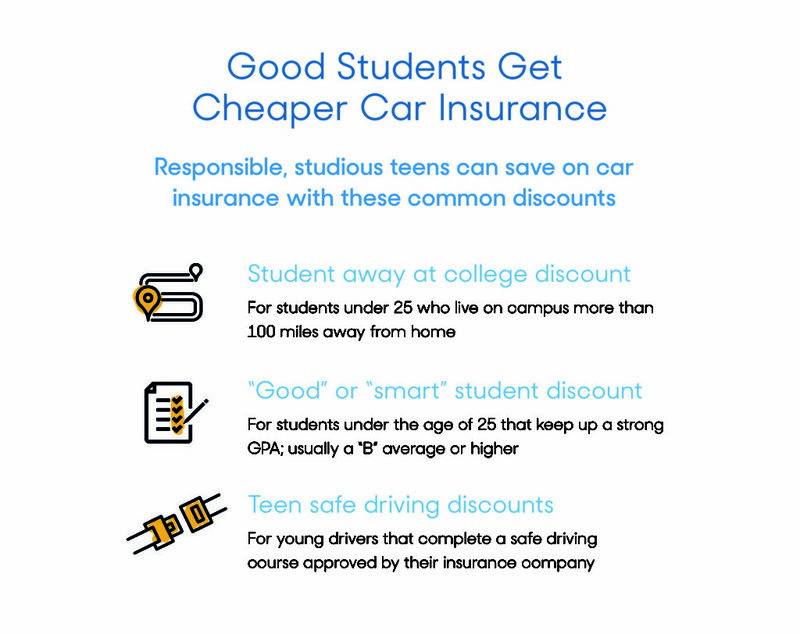 Many insurance companies offer a “student away at college” discount, which lowers rates for teens who go to school more than 100 miles away from home and won’t be using the family car very often. Be sure to let your insurer know if your teen lives on campus — and keep them in the loop about other big changes in driving habits, too. Instances where you can prove that your teen will be using the family car far less (or not at all) might qualify you for a rate drop. Developing truly responsible driving habits takes a lot of practice — far more hours than teens are able to get in their driver’s ed and behind-the-wheel courses. That’s why it’s so important for parents to continue coaching their kids and encouraging good habits. Plus, helping them drive better is ultimately in your best interest: The longer your teen drives without incident, the lower your family’s insurance rates will drop over the years. How can I teach my teen safe driving habits? Below are a few great resources tailored to young drivers and their parents. Check these out for information on teen-specific risk factors and tips for safe driving habits. Did we mention? Your car insurance premiums are bound go up when you add a young driver to your policy. Thankfully, there are ways to combat the rate hike. Check out the four best ways to lower premiums when insuring a teen driver.